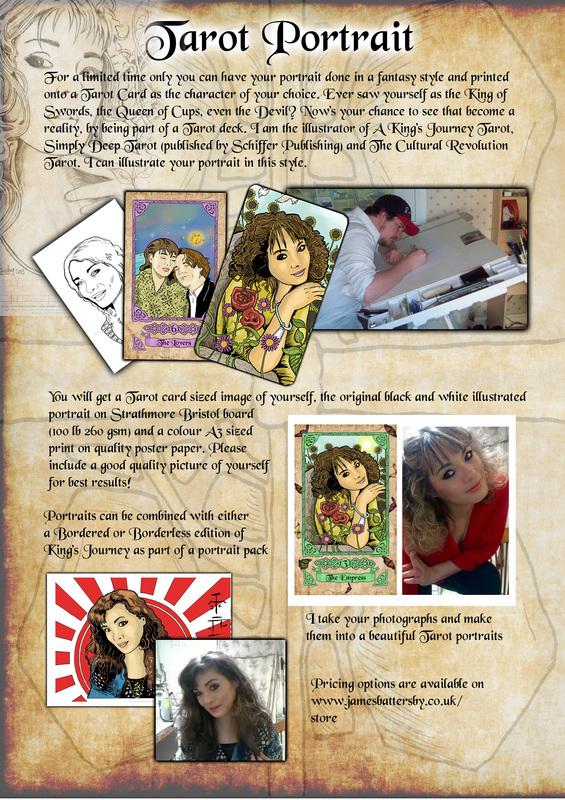 For a limited time, i am offering Tarot portraits* to coincide with the re release of King's Journey Tarot, my first ever Tarot work. If interested, please contact me at [email protected] or visit the store. *If you are interested in portraits of a non tarot related variety (in otherwords a standard illustrated portrait) i am willing to do that. What you will get is the original illustration and an A3 colour print ( i colour digitally so no colour originals are available. Sorry). Again i can do your portrait for you and it will be the same price of 60 U.S dollars from my store. 60 U.S dollars amounts to 40 pounds UK sterling. Currently taking orders for Memorial Day and 4th of July. Order now for the chance to have your portraits ready for the day. Perhaps this would make a great gift for a loved one for a special occassion such as birthdays, Valentines day, Christmas. Fancy a halloween style portrait? I am open to any and all suggestions.